However, the most compelling evidence for the existence of dark matter came more than 40 years later, when astronomers started measuring the speeds at which stars orbit the center of the galaxy they are in. If you look at the photo of a spiral galaxy above, you will see that it is much brighter at its center than it is at its edges. Based on such observations, it was assumed that most of a galaxy’s mass is located at its center. If that assumption were correct, it would mean that the stars near the center of the galaxy would orbit the center faster than the stars at the edge of the galaxy, just as the planets near the sun orbit much faster than the planets far from the sun. Now, of course, their results are not conclusive. They need to be replicated, and if replicated, they only rule out the most reasonable distributions of dark matter that have been suggested. You can construct a dark matter distribution that has a truly odd shape but is still consistent with the both standard view of dark matter and the results of this study. Also, like almost all studies in astrophysics, there are assumptions involved in reaching the conclusion. For example, the researchers assumed that red giants are distributed smoothly both above and below the plane of the galaxy. That’s a standard assumption, but it might not be true. If nothing else, however, this study shows that we don’t really understand the distribution of dark matter in our galaxy, much less throughout the universe. As a result, the next time you hear it stated as fact that most of the matter in the universe is dark matter, realize that like many things stated as fact these days, such a statement is rather far from a fact! 4. C. Moni Bidin, G. Carraro, R. A. Méndez, and R. Smith, “Kinematical and chemical vertical structure of the Galactic thick disk II. 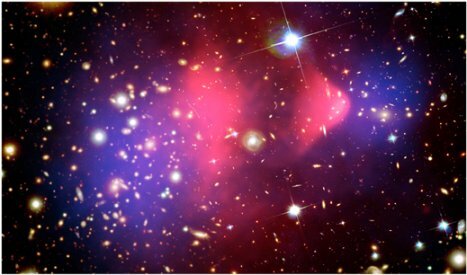 A lack of dark matter in the solar neighborhood,” accepted for publication in the Astrophysical Journal, available online. Another subject I wish I knew a whole lot more about. I wish astronomy curriculums focused more on the galaxies and less on the solar system. Love the photos. Grace, I think most curricula focus on the solar system because it’s easier to explain. But you’re right – the galactic stuff is much more interesting. I am not very familiar with astronomy…But is it possible that dark matter is present in some systems and not in others? I don’t think I understand why the lack of dark matter in the region of study is significant. Do the current “dark matter hypotheses” predict the presence of dark matter in the region? Jonathan, the current view of dark matter does, indeed, predict dark matter to be in that region of the galaxy. Like all galaxies, the stars in our galaxy orbit the center at roughly the same speed, regardless of where they are. In order to use dark matter to explain that, you have to assume a distribution of dark matter in the galaxy, and the assumed distribution does put dark matter in the region that was studied. Their results don’t need ANY dark matter, but with all the uncertainties, the results could allow for, at most, only one-tenth of the dark matter that is supposed to be in the region that was studied. Now as I said in the post, you could get around that by assuming a much stranger shape for the distribution of dark matter in the galaxy, but that just adds another problem: Why is the dark matter distribution shaped in such a strange way? I’ve heard a lot about the “Plasma Universe” hypothesis, while I don’t agree with most of it (planet formation is one), it does ask the question: With 99% of the universe’s mass being plasma, does electricity play a part on the grand scale? Seth, I am always a fan of people working on alternative models. I do think Plasma Cosmology explains the rotation curves of galaxies well (as does Modified Newtonian Dynamics) without needing dark matter at all. However, there are things that Plasma Cosmology doesn’t explain very well, such as the Cosmic Microwave Background Radiation. As you indicate, there are problems with galaxy formation as well. Plasma Cosmology doesn’t use supermassive black holes to build galaxies (which appeals to me), but as I understand it, the proposed mechanism requires currents that are amazingly large – so large that they seem unsustainable. Also, to get the distribution of elements that we see today, Plasma Cosmology depends on a mechanism that would produce far too many X-rays and gamma rays. So in the end, while it is an interesting hypothesis, there is a lot of work to be done to make it a major contender. 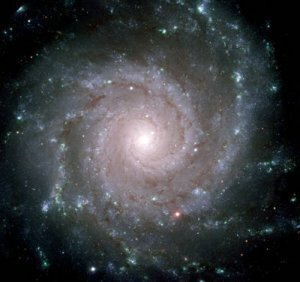 If all the stars in a galaxy orbit the center at the same speed, is there a connection between that fact and the spiral shape some of them have? I would expect the innermost stars to “get ahead” of the outer ones if they were traveling at the same speed, but had a shorter revolution to make. By the way, I love your blog Dr. Wile. I first heard of it when a friend of mine linked me something you had written regarding the nuclear disaster in Japan -I really appreciated your calm attitude at a time when everyone else seemed to be panicking. Thanks for writing so much fascinating stuff to read since then. Keith, you are correct that the simplest treatment of galactic motion would indicate that over time, the spiral galaxy should “smear out,” because since the stars orbit at mostly the same speed, the ones that are farthest from the center don’t make as many orbits as the ones closer to the center. The one thing you have to realize, however, is that the arms of a spiral galaxy do not contain more stars than the area in between the arms. The arms stand out because the stars in the arms are brighter than the stars elsewhere. So you don’t necessarily have to keep the same stars in the arms in order to get the spiral galaxy to remain spiral. All you have to do is keep the brightest stars in the arms. One way you can do this is to try to find a mechanism that will keep all the interstellar dust concentrated in the arms so that new stars keep forming in the spiral arms. That way, the spiral arms stay bright, even though the stars in them keep changing. While there is no model that is consistent with all the data, there are models out there that try to do this, either by using compression waves or halos of dark matter. Oh, almost forgot: Thanks for answering our questions, I really appreciate it! Mystery always makes science exciting, it’s especially interesting when two theories, that are in conflict with each other, disagree and say completely different things. My pleasure, Seth. I agree – it’s the mysteries that make science interesting! Thank you for providing this. I like how you consider the facts before anything else. I think just today as I read through your articles that my mind changed on some things on Scripture. Note to self, safe to believe in 24-hour days, but it is not worth insisting upon. Second note to self, ask God what the Genesis days really were later on. Anyway, as I look through dark matter, I am reminded of its nemesis dark energy. I wonder if dark energy is really just entropy affecting dark matter. My thoughts are that we haven’t detected it, that it decreases dark matter, so I wonder if it is just entropy. I want your say, in case I may be missing something. Jacob, dark energy is quite different from dark matter. While dark matter is an assumption used to explain why galaxies rotate the way they do (and a few other things), dark energy is used to explain why some observations indicate that the acceleration of the universe is speeding up. In other words, dark energy is the source of a repulsive force that works against gravity. If it exists (and I doubt that it does), it has to be more than entropy, because entropy would not work against gravity. Very interesting. The search continues! Thank you, Mr. Wile.